Here you see a horoscope set for the White House of the moment that transit Mercury rx (turns direct Sep 5) hits the precise degree of The Great American Eclipse of August 21, 2017 @28Leo32:56 in the 1 North Saros Series. And with Mars @29Leo12, the warrior planet has just conjoined the precise eclipse degree himself and is, as you know, the quarrel loving Donald Trump's rising planet natally (Mars 26Leo+). Also note that a 1 North Solar Eclipse was the Prenatal Eclipse of the 9/11/01 WTC attacks. Yes, I've stuffed quite a bit of basic and other chart info onto the horoscope so please enlarge the image if you wish to check it out for not all will be mentioned in the text, below. Shaded green is the area Mercury holds sway in 12th, 1st, 4th, and 5th houses (Jupiter intercepted in 5th h, Uranus intercepted in 11th h--Jupiter-Uranus opposition = political conflicts) which then key their opposite houses: 6th, 7th (Saturn conj Trump's Moon-SN), 10th, and 11th. A neglected listing is the transiting South Node conjunct MC (status and reputation) and transit Moon (public mood) suggesting a lack of popularity and the public's disappointment and separative emotions over Trump's desultory performance. But why do I display this particular horoscope and what is the significance of communicator Mercury hitting the eclipse degree? My reason is based on the fact that part of the theme of a 1 North Solar Eclipse is: "information is distorted and possibly false" (Predictive Astrology, B. Brady). 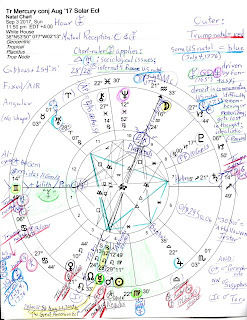 Be that as it may, you see in the horoscope that Mr. Trump's natal Uranus rises in this chart which suggests his typical unpredictable, eccentric, off-kilter responses to up coming events, opinions, and criticisms; Uranus will bring Trump's North Node (encounters; direction) and Sun (ego; pride) with it. 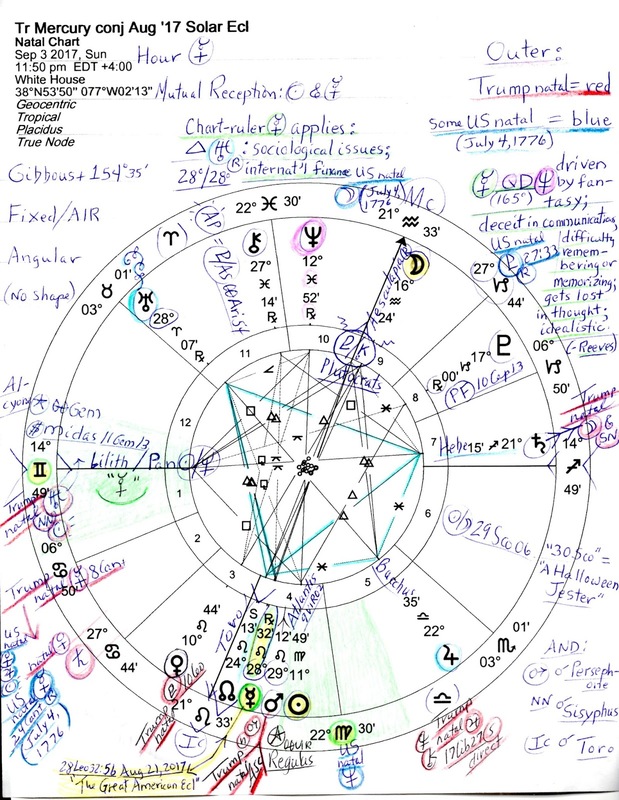 So not only does transit Mercury activate the implications of the 1 North Solar Eclipse that split America from Oregon to South Carolina in August and which conjoined precisely the natal Ascendant of Donald Trump, but Mercury is the chart-ruler during this, an Hour of Mercury. As chart-ruler we find Mercury making only one applying Ptolemaic aspect--a trine to tech-savvy, rebellious, novelty loving reformer Uranus (a zealous Utopian anarchist when in Mars-ruled Aries - Ebertin). Emphasized, as you see, is a full 4th house of Roots and Foundation of the Matter but also of The Drain. Does this remind you of Hurricane Harvey's destructive effects on the good people of Louisiana and Texas and the continued flooding? Very sorry to say, me too. Specifically, this Mercury-Uranus trine forming (0A25) indicates that many ideas and communications now concern large societal issues which relate to personal interests (and as you know, there are multiple such issues in discussion). Meetings should be fairly easy to organize and unexpected benefits may be gained via information discovered or through certain people attempting to impress us (or Trump) with their ideas and opinions (2 exs: the media; political partisans). Successful activities may include international finance, scientific and technical areas, air travel, and/or the societal issues cited (- Skalka). As you notice, success with 'international finance' is on the list yet investigations (Mercury) concerning Mr. Trump's troubles via foreign banks and countries such as Russia (plus, China and Germany, I would add) have a ways to go before Trump's name and reputation are cleared of such a stain if indeed it ever can be. Sep 2, 2017 Update: have just added to my WordPress blog a few details and quotes concerning September 3rd's Sun Virgo-Moon Aquarius blend if you'd care to have a peek.